Want to guess why Wal-mart is so popular? One stop shopping. People like going to one place to get everything. That’s how valuable our time is. When I started to put together an article on credit card debt problems that so many people face, I decided to put all of my best ideas and thoughts down on paper and then collect other articles related to credit card debt so that you could use this article as a sort of one stop shop as you deal with credit card debt problems. Though I’ve already put together a A Guide For Getting Out Of Credit Card Debt, I wanted a resource that included some information from all around the internet. 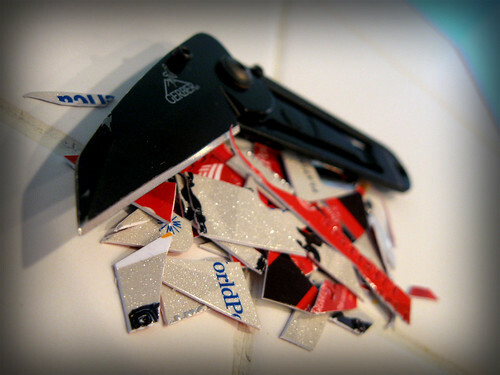 How Do You Know If You Have A Credit Card Debt Problem? Of course, every financial commentator will answer this question differently, but here is my simplistic equation. If you cannot pay off your credit card at the end of the month then you have a credit card debt problem. Perhaps I would be willing to go as far as saying if you can’t make the payment once, but catch back up the next month you might be ‘OK’. However, credit is such a dangerous thing that the best course of action is to closely monitor your debt usage. The moment it gets out of hand, avoidance is the best policy. Find a guru, mentor, or coach. The truth is that sometimes we tell ourselves lies that make us poor. A coach can help identify those false thoughts. The mentor does not need to be someone you know. It can even be someone who coaches you indirectly – like Dave Ramsey. Tell everyone I know, “I’m trying to pay off credit card debt”. Just saying it out loud makes the whole process easier. Why not just tell people rather than trying to make an excuse every time they invite me out to lunch? Sell anything that is absolutely essential. By the way, get feedback from a third party on what is absolutely essential. A Lexus wouldn’t be on the list. Surround myself with people who would encourage me. Establish a frugal community. If you can’t do #2, you’ll never be able to do this step. However, once you tell people you are getting out of debt, others will want to join you. Work together towards a common goal. Take on extra part time jobs. Read the total Money Makeover. This is the first book I recommend for people in any kind of debt. Send my credit cards to jail (or one of the other options listed below), or cancel them. Cut my spending. No more eating out. No more vacations. When I set goals, I work at them like crazy. Develop a game plan and get organized. I’d know how long each card would take, which one to pay off first, and how much to pay towards each car. If you don’t already have a personal finance software, you should consider one. Talk to the kids about the family goals. The kids need to be on board, too. Work like crazy to keep be sure my wife and I were on the same page attacking the debt together. Here are 101 Ways To Improve Your Marriage Money Relationship. Read inspiring debt free stories. 1. Hide and seek. Ask a friend to come into your house and hide all your credit cards. Decide not to use a credit card until you find all of the cards. You’ll get so sick and tired of looking for the cards (the inconvenience of it all) that you’ll stop and ask the question – isn’t there a better way? Lots of times we use plastic by default. We get into the habit and mindlessly slide our cards across the cashier’s table. But, if you were stranded on a desert island, would you find a way to live without credit? 2. Freeze da life out of them. Take an old margarine container (or similar) full of water and put your credit cards inside. Shove the container into the freezer. This helps curb impulse shopping. If you know it’s going to take hours before using the card (no pouring hot water on the ice! ), that gives you time to consider the legitimacy of the purchase. 3. Set credit card spending guidelines. Make it fun and make it formal. We, the people who reside in this house, do hereby declare that as of this day forward we will no longer use credit cards on a whim … Our family has credit card guidelines. Here are some of our core tenants: (a) Credit card purchases only for items over $100; (b) the purchase must be decided before we go to the store; (c) both husband and wife must completely agree with the choice. 4. Write a eulogy for your credit card. There was a day and a time that we were codependent on each other. I couldn’t eat, I couldn’t sleep, I couldn’t shop unless it was by my side. Slowly we started to drift apart. I started to realize how it was using me and punishing me. So I broke up with my credit card. I haven’t heard from it since that day until now. Imagining life without credit cards makes living without credit cards much simpler. 5. Put your credit cards in jail. Keep them in a safe deposit box. Going to the bank is such a pain in the neck. However, if that plastic tool is locked up where you can only access it during business hours, then at least you’ll get tired of taking trips to the bank, and eventually you’ll seek out a better way of buying things. Which To Pay First – High Interest or High Balance Credit Cards? What’s the Real Cost of Your Credit Cards? Debt Goal – a proven resource to help you pay off debt. That one about freezing your credit cards in a block of ice is awesome. :>) I’ll have to remember that… I could use it in other situations too. I don’t see the connection beewten the derivative bubble and the fed debt-based system. However, I do have thoughts on both.The administration needs to work with congress to repeal the CFTA (Commodity Futures Modernization Act of 2000) to re-regulate commodity futures. (Plus a lot more. Such as repeal Gramm-Leach-Bliley (1999). )As for the fed and the debt-based system, sure, too much debt is bad. However, what would do you do when there’s an emergency and you (or a loved one) might die if you don’t run up your credit cards? Well, of course, in almost every case, you’d use the credit cards. Chances are some day (as we’ve done before) the debt can be paid down especially if we don’t overspend. Clinton did it! This is an excellent post! You included a ton of information all in one place-just like Wal-Mart! I especially love the part about giving your credit card a eulogy! I like the idea of putting the credit card in jail! ha! I don’t like the one stop shopping for some reason…. That a great list of resources (talk about one-stop shopping!). Your answer will be ciqrtiued by your ability to:define the difference between a debt system vs a credit system,explain the Preamble to the Constitution,map the parallel of the 1973 oil shock and the 1982 peso devaluation to the present day,tell us why Portugal should follow the example of Iceland,and list the types of firms on which side of the firewall they belong. Wow, a long and comprehensive resource. What do you think about transferring some of the balances using a 0% intro rate? The drawback with these is that lot of them have fees nowadays. But if you do some of the math, and are committed to getting out of debt, this could be more than just a band-aid fix. The 0% intro rate can help someone pay of cc debt faster as long as they have a good game plan to pay off the debt. Shuffling it every few months is not a game plan. I hope that helps your readers as well! PS- @ Favor I totally agree! Republican Nixon recognized Red China and sold out the Taiwanese.Republic George H Bush gave Red China most farevod Nations status.Republican George W Bush borrowed 2 trillion dollars from communists, to pay for tax cuts.What’s their claim now? China isn’t Communist that’s pretty strange, because there is only one Party in China (take a wild guess what its name is? ), and if you try to start another you will be imprisoned or shot.The fact that they sell crap to us and let us send all our jobs there is irrelevant. side of your story. I can’t believe you aren’t more popular given that you surely have the gift.